This post isn't actually about Phil and Kirsty. It is about location though - and its importance in search engine results. The recent Venice update by Google means that more and more searches which don't precise location will come up with local results. 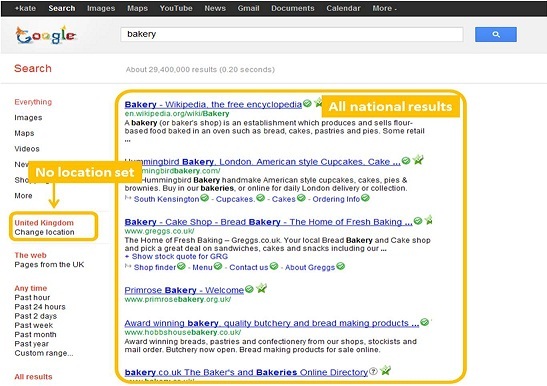 For example, if you type "bakery" with your location set, you'll get results that are in your local area, alongside "national" results. When my location is set to Bath, UK. Think it's a fluke? Try it yourself, for your business - whether that be with the search term "dentist", "SEO", "florist" or "italian restaurant", the effect will be the same. This is especially important as because Google auto-detects your location, almost any search will start to return localized results over general results. How to optimise your website for location? Chances are, there's something about their website that's led them to that top Google ranking. In the example above, all of the local results shown are also visible on the map on the right hand side. Whilst pretty standard SEO, it's important to ensure you've got the right keywords, alongside your location in here. 2) Get ahead of the competition - do better ! To get ahead in the rankings, you need to do more than the competition. It's not just product pages that need to be optimised ! 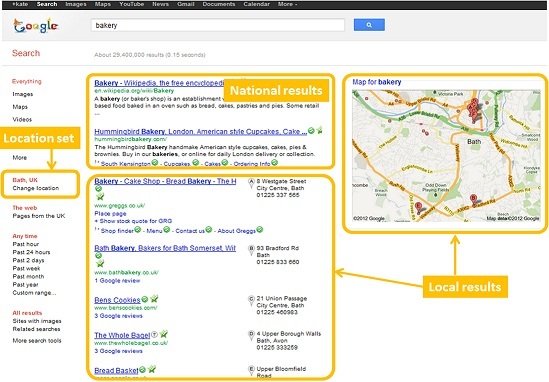 Consider how ALL your pages will rank in terms of localised search. This means not having multiple pages with the same content and just the location changed. Thanks to the Panda update, low quality content (especially if it is duplicated), having "cookie cutter" content across your site just isn't adequate. How does your site do in localised searches? Are you getting on the first page? If you need any help with your website optimisation or you struggle to rank on page 1 of Google for your area, contact us and we will work our magic to get you there.